We increasingly see claims low volatility in the markets may be structural. Even as we agree that some of the analyses we see make good points, we are concerned we may be setting ourselves up for a major shock. Let me explain. Before getting into the details about the current environment, let me make some general observations. In my experience, complacency, with its cousin low volatility, is the best bubble indicator I am aware of. Perceived safety gets investors to pile into investments that they later regret. When it happens on a massive scale, major market distortions may be created that can lead to financial crises. And as the tech bubble that burst in 2000 shows, even if there is no systemic risk, the unwinding can be most painful to investors. In 2008, however, the perception that home prices always had to rise had become engrained in highly levered, yet illiquid, financial instruments, causing the unwinding to bring the global financial system to its knees. In our assessment, however, make no mistake about it: assuming for a moment the next crash won't take down a major bank, doesn't imply it cannot wipe out much more of your wealth than you ever anticipated. Indeed, lower bank leverage is given as an argument as to why volatility is lower these days. Except that the run-up to the financial crisis of 2008 - a period in which banks were extra-ordinarily levered - also showed low volatility in a variety of markets. It was the perceived safety, embodied by quasi-sophisticated value-at-risk (VAR) models that got risk managers at financial institutions to gear up. What could possibly go wrong, right? A more convincing argument I hear as to why low volatility is structural may be that information nowadays gets absorbed more quickly. On the one hand, we have computers scan the news in milliseconds, often trading without human intervention. And we have more computing power, allowing for a more efficient implementation of any investment process. Market makers in exchange traded funds also help in the execution efficiency of markets, possibly exerting downward pressure on volatility. However, let's not forget that volatility lowered in this fashion may have the same implication as low volatility in the building up of any bubble: it is the perceived risk that is lower, not actual risk. Machines are fantastic at certain aspects, be that keeping spreads tight in an exchange traded fund, or scanning Twitter for keywords. Trades initiated in this fashion provide liquidity to the markets, but that liquidity can evaporate rather quickly when the machines go off-line. Let there be a glitch in the markets for whatever reason (say, someone dumps a large number of derivatives in off hours), and today's incarnation of automated traders tend to wait it out. In the meantime, stop loss orders of other market participants may be triggered, possibly causing flash crashes. One argument is that low volatility is due to a lack of economic surprises. We get emotional about elections, but when the economy is stuck in a low growth environment with few deviations, it only makes sense for markets to be less volatile as well. That may be the case, but in our assessment won’t stop from investors pushing asset prices to unsustainable levels on that backdrop. I have little doubt that a substantial driver of low volatility may be central banks. Low interest rates and quantitative easing (QE) compress risk premia; in plain English, this means not only that junk bonds trade at a lower premium over Treasuries, but that perceived risk is reduced in all markets, including equities, causing volatility to be lower. When central bankers "do whatever it takes," it is no surprise that investors chase yield without being concerned about negative consequences. But when central bankers "taper" their purchases, odds are that volatility comes back as taper tantrums have shown. The same should be the case when the Fed raises interest rates or "normalizes" its balance sheet. But wait: this hasn't happened, emboldening those who argue we have a structural change. With all due respect, I believe this is the wrong conclusion: in 2016, the Fed was hostage of the markets. Eager to raise rates, the folks at the FOMC realized they could only raise rates if the market let them. Any Fed official will tell you they won't be held back from raising rates simply because equity prices might fall. Indeed, any incoming Fed chair (and we will have a newbie early next year) will take the job with the best of intentions, not be bossed around by the markets. Except that falling equity prices are often associated with expanding risk premia, i.e. plunging junk bonds; that is, they are associated with deteriorating financial conditions. And the Fed is always ready to respond to “deteriorating financial conditions.” You tell me what the difference is in an era of elevated asset prices. Still, the market appeared to present the rate hike earlier this year on a silver platter. Just as a bull market makes investors feel very smart, a rate hike where the wheels don't fall off the markets makes the guardians at the Fed feel like they are doing their job properly. Maybe so. I have a more somber interpretation: in hesitating so long to raise rates, the Fed has fallen ever more behind the curve. Sure, the Fed may raise nominal rates, but real rates may continue to be low to negative. Federal Funds futures currently price in 2.5 more rate hikes until the end of 2018, including the one we are expecting today (we write this analysis before the June FOMC decision). How is that possible with an economy that is allegedly booming, where wage pressures, albeit not severe, are gradually creeping higher? As such, my sanguine interpretation is that the reason the market is not spooked is that it thinks the Fed is going to stay "behind the curve." As a word of caution, with a new Fed chair coming next year, I would not count on the market being complacent; the new chair may well try to assert himself or herself, causing risk premia to rise. The pressure cooker may well try to release steam once again, until the Fed chair then reacts to what may well be deteriorating financial conditions. This implies the Fed won't be able to normalize its balance sheet, but is more likely to be heading towards QE again. Indeed, my interpretation of FOMC talk is that many members believe more QE is not a question of whether, but of when. If my analysis is correct, it suggests low rates for a very long time. And that, in turn, may of course mean that risk premia will ultimately be compressed yet again. So, maybe, it is different this time? Let's look at equity investors. The brilliant minds (brilliant because they have made lots of money in recent years, please take this reference as being cynical) know that central banks will come to the rescue. So why not buy the dips? And stock prices always go up, don't they? You can't possibly be smarter than the masses (the index), and the index is going up, so buy, buy, buy. And we hear that this is different from the dot com bubble as, according to some metrics, stocks aren't terribly overvalued and could no up another 20%; let's make that 50%. I hear arguments for buying bitcoin, as it could go up tenfold or more, but it can only go down 100%, so the risk/reward must surely be worth it. Indeed, I agree that it is extremely difficult to identify the top in a bubble. The question, in my view, is whether it's better to be early or to be late in taking chips off the table. It clearly depends on the risk profile of investors, but I would like to caution that those who don’t prepare early may well be late, terribly late. Fear not, as the government might bail you out. Except that they may not this time around, as banks aren't over-levered this time around. In our assessment, you ain't getting a bailout unless a systemically important institution is at risk. Without providing specific investment advice, my view is that the best short-term strategy may be a good long term strategy. That may mean to rebalance a portfolio, take chips off the table, when times are good. The problem is, where on earth does one put those chips? Historically, one would rebalance to fixed income, but in an era of extraordinarily low rates, investors are reaching for yield in the bucket that ought to be "safe." You don't need to be a doomsday forecaster to suggest that many investors may be over-exposed to risk assets as those higher yielding fixed income instruments may exhibit a high correlation to equities in a downturn. And when the masses all realize this - granted it may take considerable time as those 'buying the dips' won't be rooted out overnight - the carnage in the markets may well be severe. 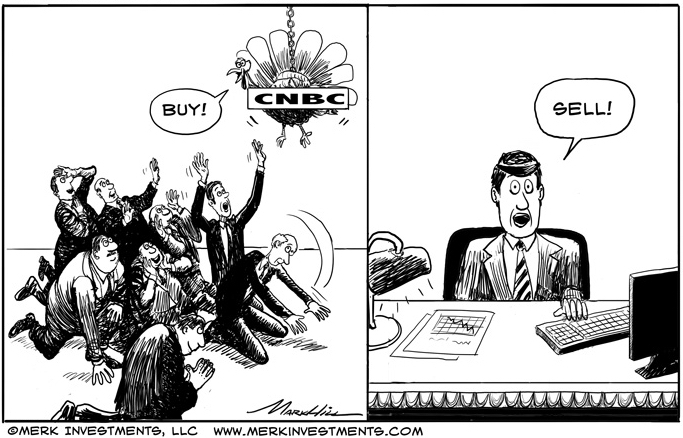 Is the recent sell-off in the Nasdaq the canary in the coal mine? We think it is, but the buy-the-dip troopers may well prove us wrong. For a day. Or a week. Or longer. But maybe not. So while the banks may not need a bailout, I'm not so sure about pension funds or individual investors. Yet, "needing a bailout" and actually getting one are different stories. This analysis wouldn't be complete without looking at another elephant in the room: Chinese banks. Credit growth in China has been breathtaking; financial institutions, in my assessment, carry too much leverage. Yet markets are well behaved. So if you are looking for a more traditional type of blow-up, China is a good candidate. Chinese banks are systemically important and, as such, candidates for bailouts. China is a perfect example in my view where you have a market that appears calm, yet is subject to underlying pressures that we believe are unsustainable. That doesn’t mean it is obvious how any unwinding may unfold. But if past shockwaves attributed to China are any indication, it may not bode well for risk assets. All of this has led to a surge in index investing. The industry argues that the average investor cannot beat the index, especially after fees. Well, it’s a mathematical certainty given that the average cannot beat the average when you deduct fees. That doesn’t mean investors should throw risk management out of the window; it doesn't mean buyers of tulips in 17th century Netherlands were right; it doesn’t mean buyers of tech stocks in the late 90s were right. Mind you, there are so many indices one can track these days that one can hardly call it passive, but active management is dead, a dying breed; or is it merely in a cyclical low? Seemingly ever rising markets appear to have created a feedback loop. To me, this question is directly related to volatility: when risk premia are low, the dispersion of risk is low, making it difficult for active managers to shine. It doesn’t help that many active managers promote lower returns. Why would you embrace lower returns than you can attain by chasing high flying stocks? The answer, of course, is risk management: those high-flying stocks might come crashing down. Should risk premia rise once again, i.e. should volatility move higher, we believe there should be a larger number of active managers standing out. As such, my take is that active management will be embraced once again. That said, we may need substantial carnage in the markets for investors to realize their need to hire an active manager once again. And tomorrow’s active manager may well be different from yesterday’s given how the industry has changed. Just a few years ago, one would have been hard pressed to find an active manager to switch to different ETFs depending on the market environment. Similarly, a new breed of systematic trading strategies has risen that were a rarity a few years ago. In between, there is a range of new tools available to traditional active managers that may well become popular again. What it comes down to is constructing and managing a portfolio that suits the risk profile of the individual, the family office, the pension plan. It’s not about constructing a portfolio that suits fast money pundits or cocktail talk. On a separate note on how to navigate these markets, please register for our June 22 Webinar entitled: “Invest in Yourself - What Your Advisor Doesn’t Tell You”. Make sure you subscribe to our free Merk Insights, if you haven’t already done so, and follow me at twitter.com/AxelMerk. If you believe this analysis might be of value to your friends, please share it with them.